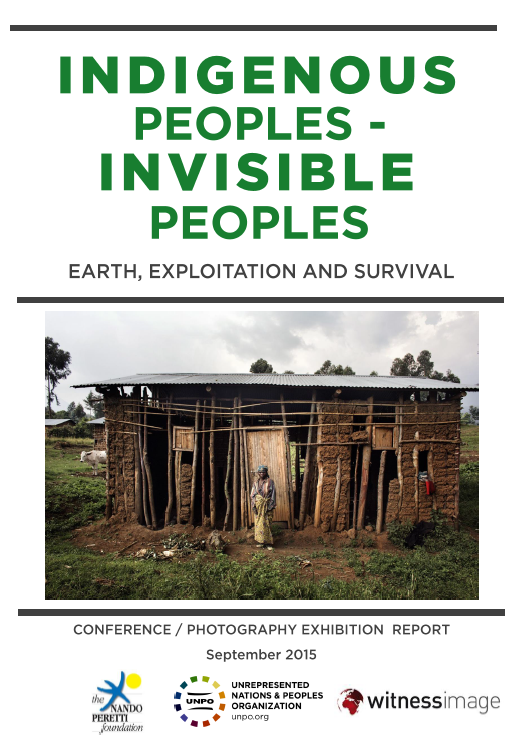 Exactly one year since the UN’s World Conference on Indigenous Peoples took place, UNPO is publishing its report "Indigenous Peoples - Invisible Peoples" following a conference co-hosted by Francisco Assis MEP (Group of the Progressive Alliance of Socialists & Democrat) at the European Parliament on Earth Day [22 April 2015]. This was followed by an exhibition opening of the photography of Luca Catalano Gonzaga on 3 July 2015 at Mundo-b, the Brussels sustainable house, kindly supported by the Nando Peretti Foundation. The report contains presentations and insights from both events aimed at exploring the contemporary challenges faced by indigenous groups. Bringing together indigenous representatives, academics and engaged politicians, both events examined issues such as the protection of ancestral lands, the preservation of cultural and linguistic heritages, legitimate political representation of marginalized groups and women’s empowerment. The promises of the UN World Conference in 2014 were to promote and protect the rights of indigenous peoples, particularly by cooperating with indigenous representative institutions, to improve access to sanitation, housing and education, and to examine human rights abuses against indigenous peoples, particularly women and girls. Sadly, as this UNPO report demonstrates, these promises have not been delivered. Globally, indigenous communities, such as the Batwa of Rwanda, the Mapuche of Chile, the Haratin of Mauritania, or the Degar Montagnards of Vietnam, continue to be the targets of injustice. States who agreed to the Declaration, which followed the World Conference have done very little to implement its provisions. The Batwa are a particularly distressing example of this phenomenon. They remain disenfranchised from Rwandan society, made destitute by eviction from their ancestral lands in the rainforest. Much of the dwindling community lives in slums, with little or no access to sanitation or education, and unable to make a living, having been cut off from their traditional knowledge and pursuits in the forest. Batwa women are subject to repeated sexual assault and exposure to HIV due to local beliefs that their bodies are able to cure the disease. Indigenous groups such as these continue to suffer heinous injustices all over the world; if these problems are to be addressed effectively, a constructive dialogue needs to emerge between European and indigenous actors. Far more needs to be done to recognise indigenous peoples as equal partners in national and international deliberations on issues, which affect them, their lands, and their resources. Inter-cultural dialogue both between different indigenous groups, and with non-indigenous groups, is also paramount to creating greater harmony in societies in which different cultures coexist.